Here, Stephen Hutsby, New Product Development Manager for Leaderflush Shapland looks at an increasing trend towards alternative veneers within door production, that move away from traditional timbers towards more rapidly renewable resources. First and foremost, it is important to look at the environmental impact of veneers Vs solid timber. When using veneer in place of solid sections of the same timber, the impact is much less since the sheer volume of material used is reduced. During manufacture, the thin slices of veneer, which are bonded together on edge to produce layons that are large enough to cover a door, enable an incredibly cost effective and environmental solution to be supplied – particularly when compared to more traditional solid timber doors. Taking this premise further still, manufacturers are now also looking at the veneers themselves – sourcing a new generation of materials that deliver comparable aesthetics and performance, with even stronger sustainability credentials. Banana plants, for example, are especially suited for use in this way and offer a viable alternative to standard veneers. Taken from the stem of the plant at the end of its nine-month growing cycle, once it has produced its crop of bananas, the stem is harvested and converted into a veneer, commonly known as Green Blade® – Banana trunk veneer. 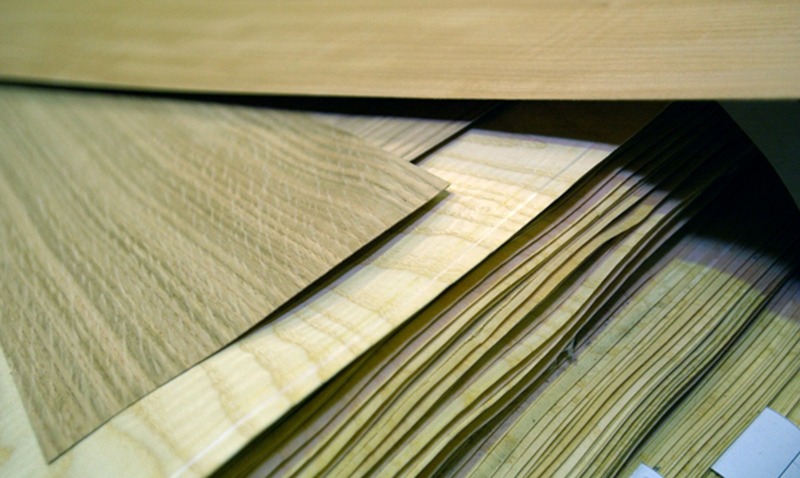 There are four variations of natural veneer colour available, due to the minerals that the plant is grown in, which helps offer an added level of choice. Once produced, the veneer is sorted into appropriate colour batches to ensure consistency. Due to the limited lengths available, Green Blade® – Banana trunk veneer is created and installed in a horizontal direction only when fitted to the door. Another material that can be produced in veneer form is bamboo, which benefits greatly from being cut back regularly as this promotes more vigorous growth afterwards. In fact, bamboo is one of the fastest growing plants in the world with reported growth rates of 100 cm in just 24 hours. It is worth pointing out that the species of bamboo used in the production of veneers is not that favoured by pandas and so, is completely environmentally friendly. With longer lengths available – some species of bamboo can in fact grow to around 30 metres tall, bamboo veneer can be laid both horizontally and vertically, depending on the desired end look. Where a more exotic veneer finish is desired, there are now ways in which this can be achieved, without resorting to the use of the actual material itself. Manufactured veneers, which are created using poplar – a timber that has full FSC accreditation, are sliced then bonded together before being dyed and cut at varying angles to successfully simulate more exotic or in some cases, endangered timbers such as Teak, Macassar, Ebony, Rosewood and Bubinga. This process also enables more readily available veneers to be created that are consistent in grain, colour and appearance – something that can be especially useful when working on large projects or those where the installation is being carried out in stages, yet a uniform look and feel is required. Timber is one of the most environmentally friendly materials available – if used responsibly – and providing a wide choice of sustainable options is the key. Leaderflush Shapland, is therefore committed to continual research and development in this area, providing customers with a host of innovative finishes that not only look great but offer the green credentials they demand.